Kangaroo apple Solanum laciniatum, from here. The Solanoideae is a clade within the Solanaceae characterised by the production of fleshy fruits with flattened seeds containing curved embryos (Olmstead et al. 2008). The derived succulent genus Nolana, sometimes recognised as a separate family from Solanaceae, is shown by molecular analysis to be positioned within the Solanoideae. Members of this genus are native to coastal deserts of western South America. 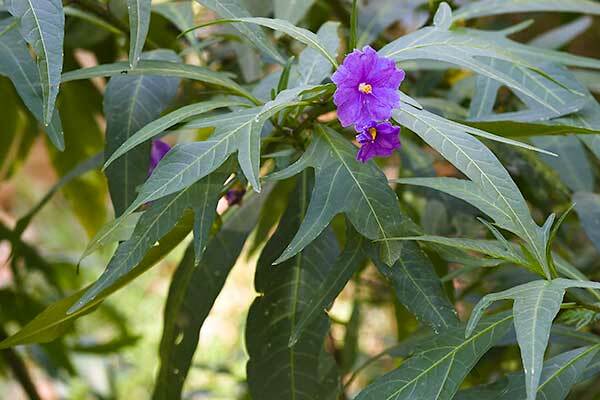 The genus Solanum includes a number of economically significant species, most prominently the potato S. tuberosum, tomato S. lycopersicum and eggplant S. melongena. Conversely, other Solanum species such as the Jerusalem cherry S. pseudo-capsicum and apple of Sodom S. sodomaeum are highly toxic. The black nightshade S. nigrum appears to have both toxic and edible varieties. Various species of Capsicum, bell peppers and chilis, are grown for their hot-flavoured fruit. Members of the genus Physalis have fruit with an enlarged persistent calyx forming a papery husk and include the cape gooseberry P. peruviana and tomatillo P. philadelphica. [A02] Atkinson, H. J. 2002. Molecular approaches to novel crop resistance against nematodes. In: Lee, D. L. (ed.) The Biology of Nematodes pp. 569–598. Taylor & Francis: Florence (Kentucky). [Ca08] Cambage, R. H. 1908. Notes on the native flora of New South Wales. Part VI. Deepwater to Torrington and Emmaville. Proceedings of the Linnean Society of New South Wales 33 (1): 45–65, pls 1–2. [Ch08] Cheel. 1908. Notes and exhibits. Proceedings of the Linnean Society of New South Wales 33: 287. [D84] Dietz, J. M. 1984. Maned wolf. In: Macdonald, D. (ed.) All the World’s Animals: Carnivores pp. 74–75. Torstar Books Inc.: New York. [G76] Gross, G. F. 1976. Plant-feeding and Other Bugs (Hemiptera) of South Australia. Heteroptera—Part II. Handbook of the Flora and Fauna of South Australia. [HH03] Hernández, J. R., & J. F. Hennen. 2003. Rust fungi causing galls, witches’ brooms, and other abnormal plant growths in northwestern Argentina. Mycologia 95 (4): 728–755. [H91] Hubálek, Z. 1991. Biogeographic indication of natural foci of tick-borne infections. In: Dusbábek, F., & V. Bukva (eds) Modern Acarology: Proceedings of the VIII International Congress of Acarology, held in České Budĕjovice, Czechoslovakia, 6–11 August 1990 vol. 1 pp. 255–260. SPB Academic Publishing: The Hague. [KS98] Klein, J., A. Sato, S. Nagl & C. O'hUigín. 1998. Molecular trans-species polymorphism. Annual Review of Ecology and Systematics 29: 1–21. [K-WK92] Korn-Wendisch, F., & H. J. Kutzner. 1992. The family Streptomycetaceae. In: Balows, A., H. G. Trüper, M. Dworkin, W. Harder & K.-H. Schleifer (eds) The Prokaryotes: A handbook on the biology of bacteria: Ecophysiology, isolation, identification, applications 2nd ed. vol. 1 pp. 921–995. Springer-Verlag: New York. [P05] Packer, L. 2005. A new species of Geodiscelis (Hymenoptera: Colletidae: Xeromelissinae) from the Atacama Desert of Chile. Journal of Hymenoptera Research 14 (1): 84–91. [RS98] Ramsey, J., & D. W. Schemske. 1998. Pathways, mechanisms, and rates of polyploid formation in flowering plants. Annual Review of Ecology and Systematics 29: 467–501. [TG88] Tepfer, D., A. Goldmann, N. Pamboukdjian, M. Maille, A. Lepingle, D. Chevalier, J. Dénarié & C. Rosenberg. 1988. A plasmid of Rhizobium meliloti 41 encodes catabolism of two compounds from root exudate of Calystegium sepium. Journal of Bacteriology 170 (3): 1153–1161. [Z02] Zhang, Z.-Q. 2002. Taxonomy of Tetranychus ludeni (Acari: Tetranychidae) in New Zealand and its ecology on Sechium edule. New Zealand Entomologist 25: 27–34.